The Trenčín Region (Slovak: Trenčiansky kraj; Czech: Trenčínský kraj) is one of the eight Slovak administrative regions. It consists of 9 districts (okresy). The region was established in 1996, before it has been a part of West-Slovakian region (Západoslovenský kraj) and partly central Slovakian region (Stredoslovenský kraj). Industry is a main branch of region economy. 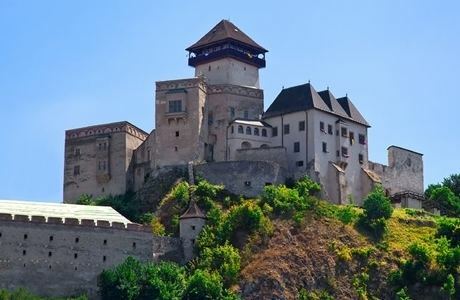 It is located in the north-western Slovakia, has an area of 4,502 km² and a population of 600,386 (2005). The Danubian Lowland reaches the region to Nové Mesto nad Váhom and Partizánske areas. There are several mountain ranges in the region: a small part of the Little Carpathians in the south-west, White Carpathians in the north-west, Maple Mountains in the north, Strážov Mountains in the centre, Považský Inovec in the south, Vtáčnik in the south-east and Žiar in the east. Small parts of Lesser Fatra and of the Kremnica Mountains mountains also stretch to the region. Major rivers are the Váh in the western part of the region, creating so-called Váh Basin and Nitra in the south-east and east, creating the Upper Nitra Basin. The Myjava River springs in the west, but flows into the Trnava Region. The region borders Žilina Region in the north-east and east, Banská Bystrica Region in the south-east, Nitra Region in the south, Trnava Region in the south and south-west, Czech South Moravian Region in the west and the Zlín Region in the north-west and north. The population density is 132 inhabitants per km², which is more than Slovak average (110 per km²), and the second highest after the Bratislava Region. The largest towns are Trenčín, Prievidza, Považská Bystrica, Dubnica nad Váhom and Partizánske. According to the 2001 census, the region had 605,583 inhabitants, with Slovaks forming a relatively homogeneous majority (97.3%), with a small minority of Czechs (1%) and others. The Trenčín Region consists of 9 districts: Bánovce nad Bebravou, Ilava, Myjava, Nové Mesto nad Váhom, Partizánske, Považská Bystrica, Prievidza, Púchov, and Trenčín. There are 274 municipalities (obce), including 18 towns (in bold), where about 58% of the region's population live.